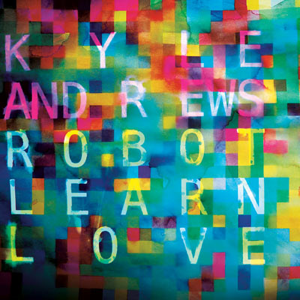 Kyle Andrews follows up his Kangaroo EP with Robot Learn Love, a tight set of modern indie electronic pop rock that launches his music out of the bedroom and into a rock club somewhere just north of Sirius Major. Gone is the acoustic guitar that made his past work so unusual for the genre, but his songwriting and endlessly catchy melodic skills are in full force, and he sounds more playful than ever. The grinding electric guitars, twee-like glock, and vocals that range from gently nudged autotune to honest-to-thank-goodness rock on “Make Me Feel Human” and effects-laden space pop of “Heart U 4 Ever” are early highlights. More conventional songs like the gorgeous string-backed anthem “Bigger,” an endless number of funky sounds, and a deft sense of when to turn off all the instruments except the guitar in the middle of the song keep things fresh and fun throughout. Also saying “Woot!” a few times doesn’t hurt. Andrews juices some real emotion out of his synths. The phasers and pitch bending applied to his voice make this the story of a flesh-and-blood Facebook-and-Twitter-addled “robot” getting his, uh… heart on. It works for more than just making heads bob and bodies move.